"Tecmo Super Bowl is an American football video game for the Nintendo Entertainment System (NES) that was released in 1991. Developed by Japanese video game company Tecmo, it was one of the first sports video games that had licensing privileges with both the league it sought to emulate (National Football League) and the player's association (National Football League Players Association), thus allowing the game to use both the names and attributes of real NFL teams and real NFL players. (Prior games used the real teams or the real players, but not both.) Player rosters are based on the 1991 NFL preseason, and attributes are based on those of the 1990 NFL season. Although the game is in some ways considered outdated, it was very successful in the final years of the NES and enjoys an extensive cult following." 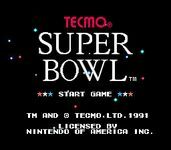 Source: Wikipedia, "Tecmo_Super_Bowl," available under the CC-BY-SA License.